Last year, in the lead up to shipping MarsEdit 4, I released a public beta. The idea was to give users a chance to start enjoying some of the new features of the app while I worked out the remaining details and added a few bells and whistles. 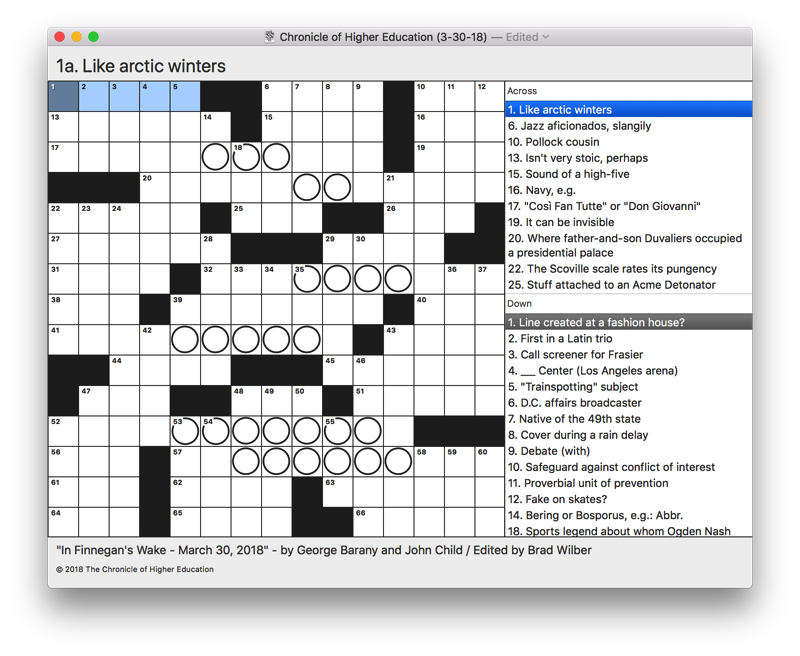 Now, I’d like to do a similar thing for Black Ink, my crossword solving app for the Mac. Black Ink 2 is available now as a public beta: Download Black Ink 2.0. This update requires macOS 10.12 or greater. Pricing for Black Ink 2 has not been finalized. New users may evaluate Black Ink 2 without limitation, as it’s set up to run full-featured without a license code while it is in beta. The best part about this acquisition is that I love, and always have loved crossword puzzles. I’ve even gone so far as to try my hand at composing them. I’ve let my passion for puzzles diminish a little bit over the years, but Black Ink makes it so easy to download and solve puzzles, I’m finding it the perfect antidote to my stress-filled days. I’ve actively maintained the app these past ten years, consistently releasing updates to refine the solving experience, add new puzzle sources, and adapt to the overall reduction in the number of free puzzles on the web. In spite of another lull in my personal enthusiasm for solving puzzles, I’ve been proud to be the steward of what I consider the best crossword solving app on any platform. A couple years ago, my interest in solving puzzles was rekindled, and through my personal experience using the app almost every day, I have been motivated to make a number of longstanding improvements to the app. Many of these come down to fit and finish. 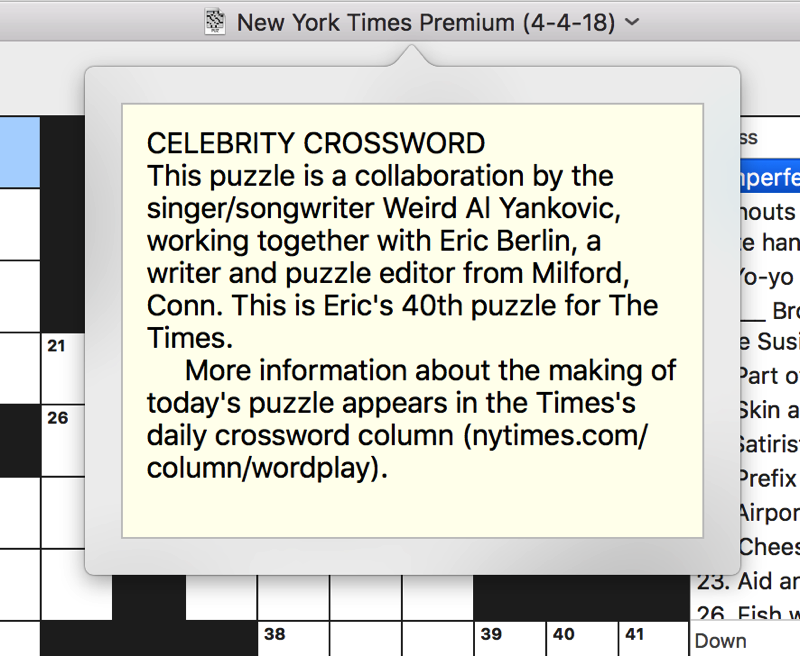 To crossword lovers, the puzzles themselves are things of beauty, and I believe they should be represented as cleanly as possible both on the screen and when printed. For this reason I have always emphasized precise rendering of puzzle grid lines, cell numbers, and answer characters. Black Ink 1 is a beautiful app, but there are areas where it can still be improved. No more drawers! Clue lists are now integrated into the main puzzle window. Sharper grid lines. On Retina displays, the lines between cells are now thinner to give an overall cleaner look. Refined circle drawing. In Black Ink 1, circled cells draw right over the cell number. In the screenshot above, see how the circle makes way for the number. It does the same thing for any of the badges for incorrect and revealed answers in cells. Clue text dynamically resizes to ensure the whole clue is visible at the top of the window. “Advance to blank” behavior now considers a known incorrect answer as “blank”, for ease of navigation when finishing up puzzle with incorrect answers. Capitalized letters are now accepted as valid (when you instinctively capitalize a proper noun, e.g.). Diagramless puzzles now open as a blank grid, suitable for solving in the app or for printing. Embedding the Timer into the main puzzle window. Tools for capturing screenshots of puzzles for social sharing. And of course because I know many of you are wondering, I do still have it in mind to create an iOS version of Black Ink. I don’t have anything to announce at this time. Please consider joining the Red Sweater Slack team to discuss the upcoming release, share your feedback, or let me know what you wish I’d add. Join the #blackink channel once you’re there! As always, I also welcome bug reports and other feedback via email. I hope you enjoy the sneak peak at Black Ink 2. Happy solving, and let me know what you think! This entry was posted to Black Ink, Red Sweater News. Both comments and pings are currently closed. Thanks for reading! Je fonctionne avec Snown Leopard, est-ce que votre logiciel peut fonctionner sur mon Mac ?